A recent census of mountain caribou in and around Mount Revelstoke and Glacier National Parks put their number at 25 animals, down from 90 animals in 1997. Only two of these caribou were last year’s calves. Similar declines were reported in other caribou herds throughout the region. Federal and provincial wildlife biologists conducting the count felt they had optimal conditions for conducting the survey. In the Columbia Mountains, caribou are adapted to deep snow conditions. In early winter they migrate to lower elevations where they live among the big old trees. The canopy created by old growth forest reduces the amount of snow on the ground making foraging easier. By mid-winter caribou migrate to the subalpine forest, using the deep snow pack to lift them up into the trees where they can reach lichens. Superbly adapted for snow and cold with their large hooves and insulating coat, caribou would have been among the first animals to return to this part of the world at the end of the last Ice Age, around 9,000 years ago. Their numbers declined here after the completion of the railway made hunting them for market possible. Conservation measures introduced in the 1930s placed limits on caribou hunting, but their numbers never fully recovered. Hunting caribou in this region ceased entirely in 1996. 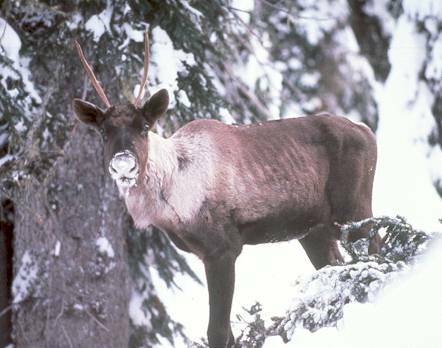 Note the ribs showing on this female caribou photographed in late winter, by Mike Tomlinson. Since the1970s, hydroelectric reservoirs and logging have reduced low elevation old growth forest habitat. The scattered remaining bits of habitat take more energy for caribou to access and expose them to more hazards. The younger forests that emerge after logging favor deer and moose instead, increasing the risk of incidental caribou predation by wolves or cougars. The past decade has seen a rapid expansion of recreation in late winter caribou habitat in the subalpine forest, prompting concern that caribou are faced with new pressures. Research results from radio-collared caribou indicate that accidents, particularly avalanches, are a main cause of mortality. Is it because they have been displaced by human activities on their preferred habitats and forced to cross more avalanche areas? This is difficult to prove either way. Does it matter? Opinion polls consistently show that Canadians want to conserve wildlife. Some of the reasons are: it’s part of what makes up Canada; it’s good for tourism; it’s a legal requirement; it’s part of Canada’s international obligations; or, morally, we are bound not to destroy the handiwork of God. The decline of mountain caribou indicates that the cumulative impact of human activities on the land around us adds up to more than this old growth forest dependent animal can take. A species that has been here for 9,000 years, can’t handle a 120 years of us. Nor is it mountain caribou alone. The loss of caribou signals a change in the make up of the interior cedar hemlock forest, a habitat with one of the richest species diversity in Canada. Likely innumerable less obvious species are faring as poorly. Caribou are our canary in the old growth forest coal mine, so to speak. Humans have prospered because of our ability to make use of a rich environment. The processes that occur in our ecosystem are what gives us air, water, food, energy, building materials, and clothes. If an ecosystem can not sustain wildlife then some of its processes are in jeopardy. Like going to bed with a quilt that is losing its squares, the loss of individual species impoverishes us all. We face a diminished future if we are unable to conserve the world that nurtures us. No single species better represents the effect of land use changes in the Columbia region than mountain caribou. Their requirement for large, connected areas of old growth forest in early winter and undisturbed use of mature subalpine forest in late winter challenges our unlimited access to natural resources and recreational opportunities. Scientific research is a tool that can provide us with good information, but how we deal with this information is a cultural matter. Ultimately, we make decisions regarding natural resources based on our values, so the goal of ecological integrity can only be realized if there exists sufficient social and political acceptance. Yet, we seldom acknowledge and discuss our ecological values and aspirations. Given the importance of wildlife in our national identity, considering what mountain caribou need to exist is as good a place as any to ask ourselves what kind of Canada we want in the 21st century.